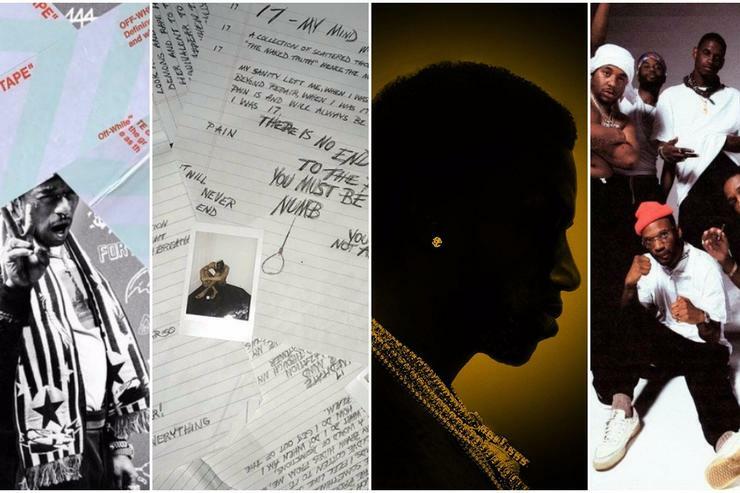 With the arrival of September, look back at August highlights from Lil Uzi Vert, XXXTentacion, Gucci Mane, A$AP Mob and more. In 2016, HNHH launched one Spotify playlist to rule them all: FIRE EMOJI: The Hottest Hip Hop Songs Right Now. The playlist is updated regularly and is representative of the best new releases in hip hop and R&B, or at least those that make it to Spotify. August was a massive month for releases, with new albums from Lil Uzi Vert, XXXTentacion, A$AP Mob that all came on the same week! Add in some dope new singles from Gucci Mane, Wiz Khalifa, Rae Sremmurd, Jazz Cariter and Frank Ocean and you've got yourself a long list of strong tracks that have been get us bumping the playlist through our headphones or car stereos all month long. There are also some albums that have been gaining steam on the underground scene, like Action Bronson's Blue Chips 7000, Brockhampton's Saturation II and Lil B's Black Ken, all of which were strong outings from the respective artists. After a summer full of bangers, August had a high standard to live up to, but there's no denying that the past 31 days have raised that bar even higher. Your move September. Our August playlist contains songs from these projects as well as many others, along with some additional releases from back in July that are still very much a part of the conversation in the hip-hop community. Subscribe to FIRE EMOJI here and stream it below. For more, check out the full archive here.